The experience begins for guests as they walk up the cobbled stairway on the western fringe of the Tai Kwun courtyard. Through the stone-paved passageway is where Dragonfly is hidden within the old Superintendent’s House of the former Central Police Station. Stepping inside the main doorway, guests are welcomed by flamboyant botanical colours. Elegant, velvet green curtains frame the doorways and windows, capturing the spirit of the Art Nouveau era’s decadence. 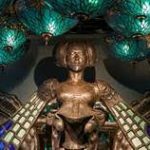 Throughout the interior, Sutton expresses his reverence for American artist Louis Tiffany, who was renowned for his favrile glass and stained-glass window creations. Embellishing the ceiling of the main bar area is a canopy of 120 turquoise glass upside-down lamps featuring yellow dragonflies, each fitted with Edison light bulbs to create a distinct shade of sea green as the yellow light filters through the glass to resemble the sun breaking through the ocean’s surface. A vibrant mosaic pattern covers the floor of the lounge, mimicking the movement of ocean waves and referencing the artwork of Tiffany. 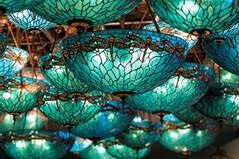 Over 500 cast-iron, handcrafted dragonflies adorn the bar area and the lower surrounding walls. “In all the projects I’ve done to date, I tend to veer towards traditional craftsmanship, especially in cast-iron works. For Tai Kwun, I used the dragonfly because it symbolises hope in times of hardship and at the same time comments on the zeitgeist we live in,” says designer Ashely Sutton. The walls of the lounge are further accented by a custom-made wallpaper with a timber laser pattern that mirrors the botanical motifs of the Art Nouveau movement. Guests can join cast-iron model dragonflies at each of the bespoke, mosaic high tables, where a steel vine-like form spirals up the table legs. Surrounding the tables are antique-style wrought iron bar stools upholstered with plush green velvet. The venue’s eye-catching centrepiece, suspended above the bar, is an enlarged, human-form dragonfly inspired by a brooch designed by French artist René Lalique. The bronze, cast-iron structure of the body is complemented by emerald and ocean blue mosaic-patterned wings that span the length of the bar. The journey continues through to Dragonfly’s outdoor area which occupies the length of one of Tai Kwun’s stone-paved passageways. 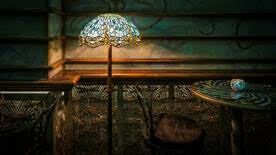 Louis Tiffany-inspired floor lamps light up the area, which also features upholstered seating recalling decadent Bohemian saloons of times past. Open seven days a week from 5pm until late, and serving a selection of bar bites and creative cocktails inspired by the location’s European heritage, Dragonfly has quickly established itself as a must-try nightlife destination in Hong Kong.